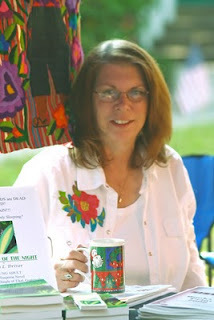 Hi – It's my pleasure to introduce Diana L. Driver, one of the contributors to The Writers’ Lens. Her stories cross the line from Young Adult adventure/suspense, to Mystery, to Romance. But today I’m focusing on what first caught my attention—her Young Adult book, Ninth Lord of the Night. What sparked your interest in Mesoamerican archeology? I’ve always been interested in history, even as a child, and in the 1980s when the Mayanists like Linda Schele, David Stuart, and Diane and Arlen Chase began translating the Mayan glyphs, I couldn’t help but be fascinated at what they were discovering. Understand, that before the social revolution of the ‘60s and ‘70s the old guard archaeologists held tight rein and were of the opinion that there was no Rosetta Stone for the Mayan glyphs. They actually destroyed careers in order not to be proven wrong. Then, the new Mayanist intellectuals appeared, translated the glyphs and now we know that the Mayan glyphs are indeed a phonetic written language. Did you already have a book in mind before you traveled to Tikal? I did have Ninth Lord of the Night mentally mapped out before I visited Tikal. I wanted to know more than just how Tikal looked; I also wanted to know how it felt to be in this ancient city surrounded by the rain forest and all its creatures. I wanted to hear and feel the jungle and touch the limestone temples. Of course my preconceived ideas concerning both plot and characters changed radically when I returned home. What’s your writing style—do you work from an outline or wait to see where the characters lead you? I usually start with a “What if?” ending. For example, “What if you really could transform into another animal?” In Ninth Lord of the Night I started with that concept, but I also wanted the main theme of the book to be the importance of saving written history. Since Ninth Lord of the Night was about another culture, I had to show the Maya through the eyes of a character who knew nothing about the Mayan people or their civilization and who could grow in knowledge along with the reader. Then, I took it a step further by inputting symbolism and making the story circular. The character viewing Zack in a vision in the prologue is the same character Zack sees in a photograph in the ending, although both have been transformed either physically or esoterically. In Ninth Lord of the Night, Zack has to find a whistling room. Is that room patterned after an actual place? The Central Acropolis is a very real structure with its maze of buildings, courtyards and stairways. It's a fascinating place. Tell us about your current projects. I’m currently researching philosophic and esoteric ideas such as Rosicrucianism, and the Hermetic texts, the Northern European Traditions including Rune Casting for a fantasy novel I’m working on titled, The Amber Stone. I also have three mystery novels and a horror novel that are all close to being finished as well as three short stories that just need additional editing. Along with my fiction novel, Ninth Lord of the Night, and its companion nonfiction Mayan guidebook The Maya, People of the Maize, I have a short, campy mystery, The End of the Tour (originally published in L&L Dreamspell’s anthology Dead and Breakfast). Written in the style of Dame Agatha Christie, it’s available as a single on Kindle for 99 cents. I also have a sweet romantic short story and a mystery in two other L&L Dreamspell anthologies. Welcome to The Writers' Lens! We hope you’ll find this a friendly place to spend some time and chat about fiction. We write in many genres, but have a single focus—to share what inspires us, what we’ve learned as writers, and what we love as readers. We find inspiration in many places, so don’t be surprised if the topics range from Celtic or Mayan history to quantum physics. We’ll share our discoveries about what works for us—or doesn’t work—in the changing business of writing and publishing. Oh, and did I mention giveaways? Please join us Sept. 30 for the blog’s official start. As you get acquainted with the contributing writers, we’ll start our weekly posts. If you are an author who’d like to promote your book, please drop us a line. We’d love to interview you!